I’m standing in a rice field in northern Laos, a few kilometres from the nearest large town, Phonsavan. It’s early morning but already hot. By noon it will be upwards of 32 degrees, and close to 40 in the capital, Vientiane. I’ve followed a man called Mark Whiteside into this field. I’ve been instructed not to wander off, to stay close to him at all times. Now we are standing beside each other, and Whiteside is pointing at something very close to us that is making my heart thud. We are looking at a partially revealed object the size and shape of a tennis ball. It is a Blu-26 cluster bomblet. What would happen were it to go off now? My colleague Brenda Fitzsimons, the photographer, is even closer to the object than we are. We would be the fatalities. Panic is suddenly thrumming through me. I’ve never knowingly been so close to death. 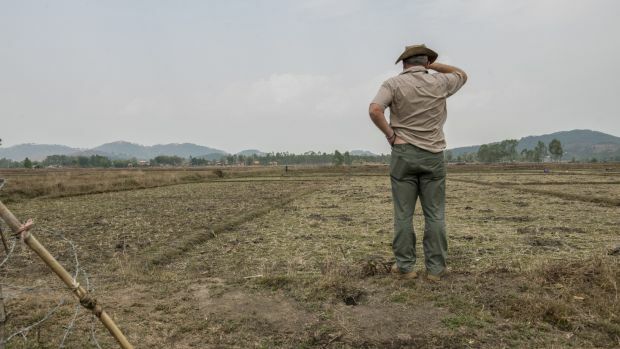 The Blu-26 we’re staring at is one of an estimated 80 million pieces of unexploded ordnance that remain in Laos, dropped by the United States between 1964 and 1973. It was one of 670 similar bomblets inside the shell of a cluster bomb, called a CBU-24, that opened in midair to drop its contents. 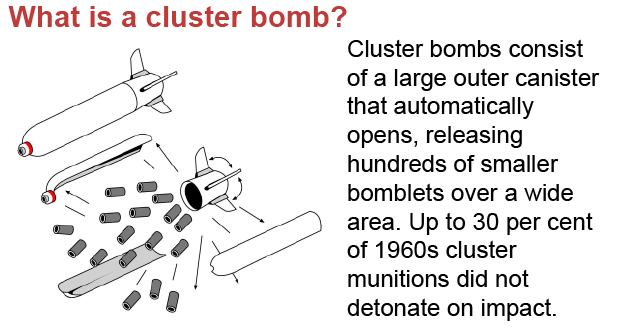 Most cluster bomblets exploded on impact. The one we’re now looking at did not. This region, Xieng Khouang, is the most heavily bombed area in Laos. It formed part of the Ho Chi Minh trail, an area that was carpet-bombed to prevent supplies being taken into Vietnam during the war between the communist north and the US-backed south. Laos is the most heavily bombed country, relative to its population, in history. The United States dropped 270 million bombs on it between 1964 and 1973, even though the two countries were never officially at war. The missions, which were run by the CIA, were part of what was later known as the secret war, as Americans were unaware of what was going on. Whiteside is the technical field manager with an organisation called MAG, or Mines Advisory Group. It’s one of half a dozen organisations that work in Laos. Slowly and painstakingly, square metre by square metre, these groups are clearing decades-old unexploded ordnance, or UXO. A staggering 270 million bombs were dropped on Laos, during what became known as the secret war, because Americans were unaware of what was going on. The 80 million bombs that never went off remain live, buried all over the country. There were more than 580,000 bombing missions on Laos between 1964 and 1973. That’s one every eight minutes, every day, for nine years. Forty-four years after the last mission, the bombs the US dropped are still causing deaths and casualties. Of the survivors, a third have lost a limb or their eyesight, and sometimes both limbs and their sight. Every year hundreds of people’s lives are changed forever by being maimed. In this developing country, where most people make their living from the land, the ability to do manual labour is essential. Yeyang Yang lives in a simple wooden house in the village of Ban Xang. Yang is 31, but you’d never be able to guess his age: very little is left of his original face, which, like his torso, was grotesquely burnt in February 2008. He was a farmer; at the time he had been doing his secondary job of burning the town’s rubbish when a bomb went off under the pile. It’s distressing to look at Yang, not only because he is so disfigured but also because it’s clear he suffered horribly. He no longer has a right ear, just a hole at the side of his head. His right hand is a fingerless clump of damaged bone and muscle. His face looks as if it is covered in a mask of melted, flesh-coloured plastic. His red eyes weep constantly, and don’t close properly. If it’s hard for me to look Yang in the face, I can’t begin to imagine what it’s like for him to live with such disfigurement. He spent eight months in hospital, and underwent skin grafts so painful that he has refused to have any more. “I was really scared,” he says softly. The charity World Education paid for his transport, hospital stay and medicine, and for a family member to be with him in Vientiane. His wife and brother stayed the whole time. His brain was also affected by the blast, and he now finds it difficult to concentrate. Yang did not leave his house, let alone his village, for years after the explosion. He was self-conscious, depressed and isolated from his family and community. The Laotian health system does not routinely provide mental-health support. What made the difference for Yang was the peer-to-peer survivor support offered by World Education. The organisation put him in contact with a man who had also survived a horrible explosion. He came to Yang’s house, and they talked together about their experiences. Now Yang goes into other communities to share his story and support other survivors. A couple of years ago he would never have agreed to talk to a journalist, much less to be photographed. His courage and ability to adapt are heroic. As we talk his six-year-old daughter, Syva, comes into the hut and snuggles between his knees, cuddling him tightly. To her he’s simply the father she loves, no matter what he looks like. 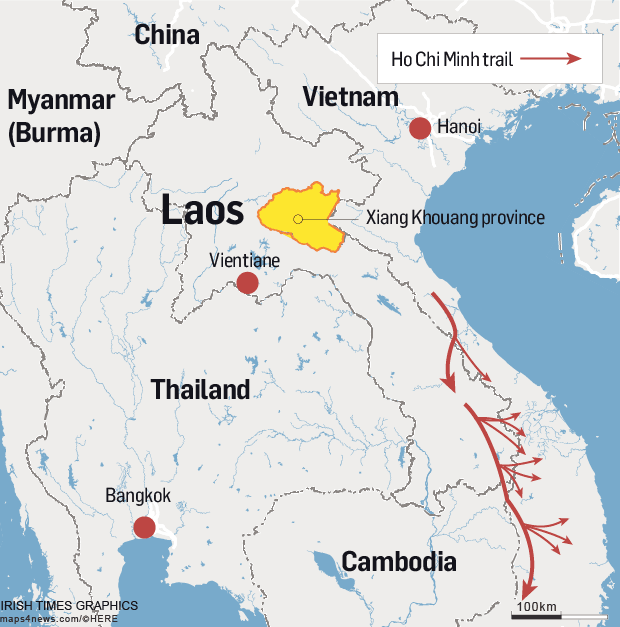 The key reason for the staggering number of bombing missions was the country’s location: part of the Ho Chi Minh trail, a route that provided supplies and manpower for North Vietnam’s war with the US, ran through the country. The most bombed area of Laos was the Xiang Khouang province. Khammeung Phommalein, who lives in the village of Leng, is 25 and no longer able to work. On October 5th last year he saw a small piece of casing in the field where he was working. He thought he could use the metal to make a knife, so he brought it home. As he was trying to open it that evening it exploded, blinding him. “He didn’t think it was still live,” the translator says. Phommalein is sitting opposite us, outside the house he shares with his wife, daughter and three generations of in-laws. There are chickens pecking at corn husks, and pots of corn boiling on an open fire. Garlic bulbs are drying in one basket, chillies in another. Four generations of the family are gathered around, including his wife, Toui, who is pregnant with their second daughter. Until his accident Phommalein was the head of the household and the primary source of its income. World Education, which also educates children and raises awareness of the dangers of unexploded ordnance, is helping Phommalein to explore the possibility of training to be a masseur. What World Education can’t do is change the facts that Phommalein is now blind and can no longer carry out physical labour. He has become, in the opinion of his in-laws, a burden. One member of Phommalein’s family privately asked World Education if it could take him away and provide him with permanent care. “He has been having nightmares because they told him he is no longer useful to the family,” one staff member tells me. About 10 people are listening to the conversation I’m trying to have with Phommalein, including those who, although they haven’t told him, don’t want him to live under their roof any more. Phommalein makes it clear, however, that he is fully aware of how his in-laws see the change in economic circumstances since he was blinded. I ask what Phommalein misses most about not being able to see, aside from the faces of his family, including his year-old daughter. The sky, perhaps, or sunrise, or even his own face? “I miss not being able to see to work in the rice fields,” he says, pragmatically. The day we go out with MAG to see the work they do we first sit in a classroom for a half-hour briefing. Whiteside shows us a map of Laos covered in red dots, which show where the bombs were dropped. Large parts of the map are composed only of red dots – the so-called contaminated areas. After the briefing we are driven to an area where one of MAG’s 12-strong teams is working. 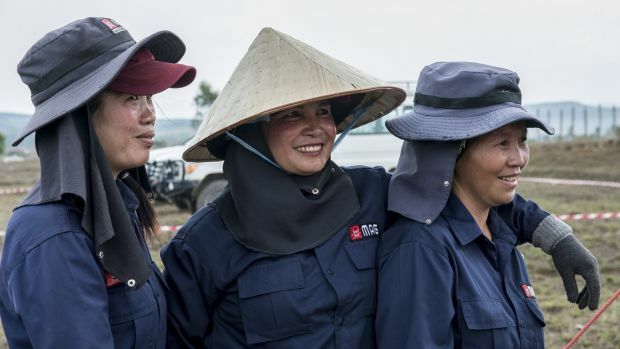 The organisation has 16 teams in this province alone, so what we are seeing today is being repeated 15 times over in other rice fields in the province, and that’s under the aegis of just one UXO company. At the temporary control centre next to the paddy we are given a second briefing, on safety. The team we are observing are all women, as are many of the teams employed by clearance companies. Every team has a medical officer, and at every new location they do a test run to the nearest hospitals. Today, if a serious injury occurs, it will take more than 45 minutes to get to the nearest hospital equipped to deal with the situation. Before this trip there was a long process of paperwork between Ireland and Laos, which included a startling request for my blood type. Here, on arrival in a tent alongside the rice field, we sign more forms. The rice fields that the UXO clearance companies work are all privately owned. The companies discuss in advance with the farmers when they will come to survey and clear the land. When we are in Laos it’s not yet rice-planting season, so the clearance work doesn’t interfere with farming. Laotian farmers plough any uncleared land cautiously: they don’t want to go too deep. Hitting a bomb with a spade or plough, dropping a bomb, or unwittingly lighting a fire over an area where one is buried are the main causes of explosions. The process of clearance is painstakingly slow. Every square metre of land has to be meticulously walked. The area is first sectioned off with string. Two people go out carrying a metal detector that looks a bit like a bed frame. If it buzzes – and it is always buzzing – a piece of red-painted wood is put beside the spot. Later someone else comes with a smaller detector, to identify more precisely the location of the metal. When the buzzing is piercing, the person carefully excavates the soil until they find the object. He shows us a bucket of twisted metal – shrapnel from the devices that did explode when dropped. When a UXO such as the Blu-26 he shows us is discovered, bamboo stakes are placed around it, with warning tape. At the end of the day every UXO that has been discovered is detonated, by itself, in a controlled explosion. Are any of these more dangerous than the others, I ask. Whiteside laughs. “They’re all extremely dangerous,” he replies. Today two Blu-26 bomblets, which have been found beside each other in a bank of the rice field, are due to be exploded. The MAG team spreads out, driving the cattle and other animals away from the site. One of the team, Kong Kham Khamphavong, goes out with a megaphone, to alert locals to the imminent explosion. “Please go home and stay inside your houses! We are about to destroy the contamination!” she shouts. The bomblets are surrounded by sandbanks, and a wire attached to explosives is unwound all the way back to where we are standing, 300m away. When they are detonated they make a large and loud explosion. I can’t imagine a further 668 of them going off at the same time. To realise that MAG’s work is being replicated over so much of Laos, day after day, is staggering. UXO companies are among the largest employers in Laos. This is civilian land we’re on, where for decades the farmer was planting his rice on top of these lethal devices – land through which his children walked to school, land close to his home. When MAG has finished clearing his paddies he’ll plough deeper, his yield will increase, and he and his family will no longer be afraid of the ground beneath their feet. Laos is primarily a rural, agricultural country, so hundreds of thousands of people live with the fear of what’s buried in the ground they walk over every day. But Laotians also have become so used to seeing UXOs that they call the devices “bombies”. It’s an uncomfortably affectionate-sounding word for a piece of unexploded ordnance. There are other examples of a kind of domestication of objects of war: empty shell cases have been turned into flower planters, makeshift boats, or fences, or used in the construction of houses. Most bars and restaurants in Phonsavan, including the bluntly named Craters restaurant, have eye-popping displays outside of shells, missiles, rockets and grenades. The statistic that stands out most during the week is the figure of 14. 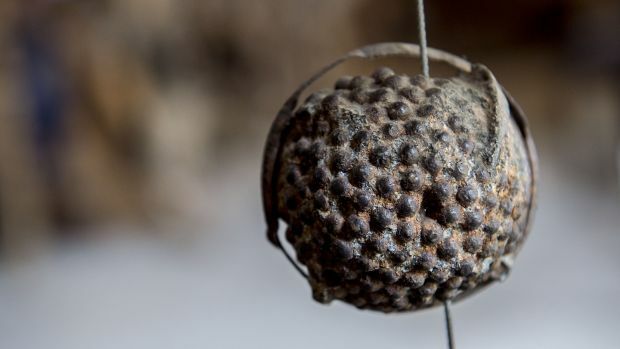 A week before we arrived a 10-year-old girl named La Lee, from Paek district in Xieng Khouang province, picked up one of these tennis-ball-sized cluster bomblets when she was walking home from school. She put it in her pocket to play with at home, thinking it was a boule for petanque, a game that’s popular in Laos. When La Lee reached her village, not far from where we were standing that morning in the rice field, she took the bomblet out of her pocket to show her cousin. A family gathering had been planned, and a crowd of people stood nearby. The bomb exploded, and La Lee died instantly. Thirteen others, many of them children, were grievously injured. More than three decades had passed between the dropping of the bomb that killed La Lee, in March this year, and her birth, in 2007. Yet she died as a direct result of that secret war between 1964 and 1973, a war that had nothing to do with her. The 13 people who were injured with her that day did not die, but their lives have changed forever. Fourteen people from one village; one dead, 13 injured. 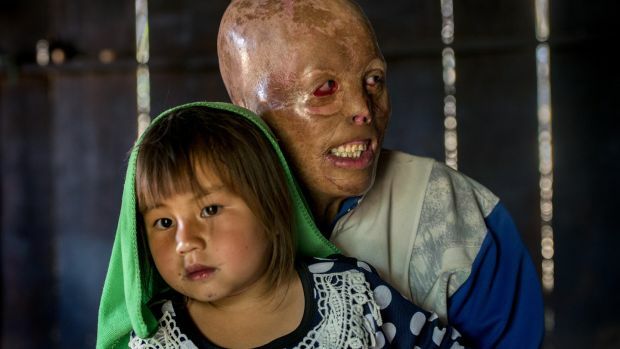 Every year hundreds of other Laotians suffer death, dismemberment and disfigurement as a result of the unexploded ordnance that often lies just below the surface of rice fields, villages and even school playgrounds. It’s the scale of this legacy of war that is so difficult to process. MAG alone has cleared 57.8 million square meters of land since it began working in Laos, in 1994. Each clearance organisation works in a different part of the country. On any day 3,000 people are surveying and clearing unexploded ordnance. The officials we meet are careful not to voice any criticism of, or even their opinions about, how the country is governed and how the aid money it receives is spent. This is partly because we are accompanied everywhere by a government press minder, who takes notes and photographs us working. (It’s unexpectedly expensive to report from Laos. Our visas, accreditation and daily media fee cost about €410. We must also pay the minder $50 a day, and cover the cost of her flight and accommodation.) She does not accompany us to meals, but otherwise she is a silent presence for every part of our reporting. Why do we need to be accompanied, and why are people so reluctant to talk on the record about what seems to be a straightforward humanitarian story of the legacy of war? “Money,” one person we talk to suggests. People we talk to off the record, when our minder is not around, cannot offer concrete proof, but they are sure that they are followed from time to time and that their movements are monitored. When Barack Obama visited Laos, as US president, in September last year, he pledged $90 million in aid to Laos for clearance. It seems not to have been paid yet, due to disagreement between the United States and Laos about how to spend it. Also, $90 million doesn’t sound quite as impressive when you realise that the US was already paying Laos $15 million a year for clearance. 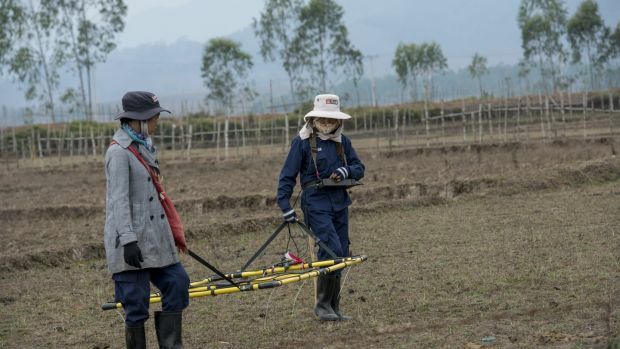 The US wants to survey the country, to determine the land that remains to clear of UXO, and it wants the extra aid to fund this. The Laotian government apparently believes that a survey will in fact take many years and that clearance will continue for tens of decades. 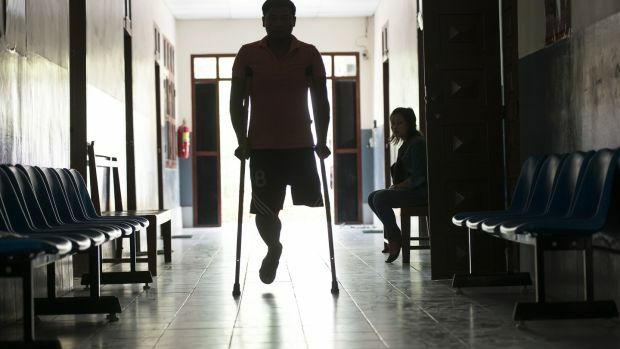 It is suggested that the Laotian government is benefitting by continuing to have UXO organisations in the country. 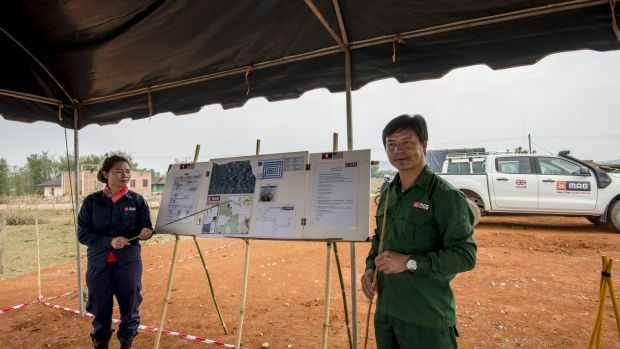 They receive funding from a number of countries, including Ireland: Irish Aid is one of several international organisations that donate to a company called UXO Lao. It is also suggested that not all of this foreign aid goes directly to the organisations it is supposed to fund, that some of it gets diverted for personal gain. It would not be the first time that a developing country had siphoned off foreign-aid money for other uses. Then there is the cost of the explosives used to detonate UXO each day. All of the companies must buy their explosives from the Laotian government, which charges a very high price. If people working in Laos are reluctant to share their views on the record, the foreign tourists at Cope in Vientiane have no such reluctance. 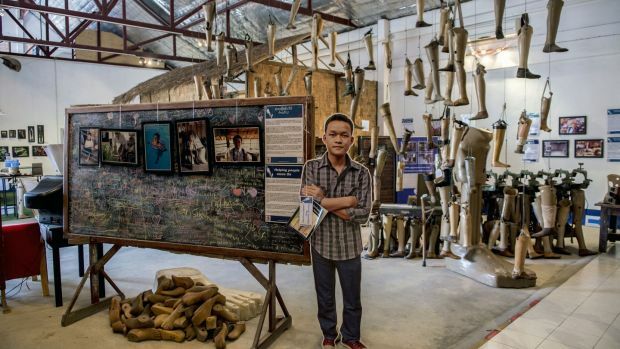 Cope, a rehabilitation centre that makes prosthetic limbs, also attempts to explain the country’s uncleared UXO to tourists. There are maps, short films and audio recordings with survivors. 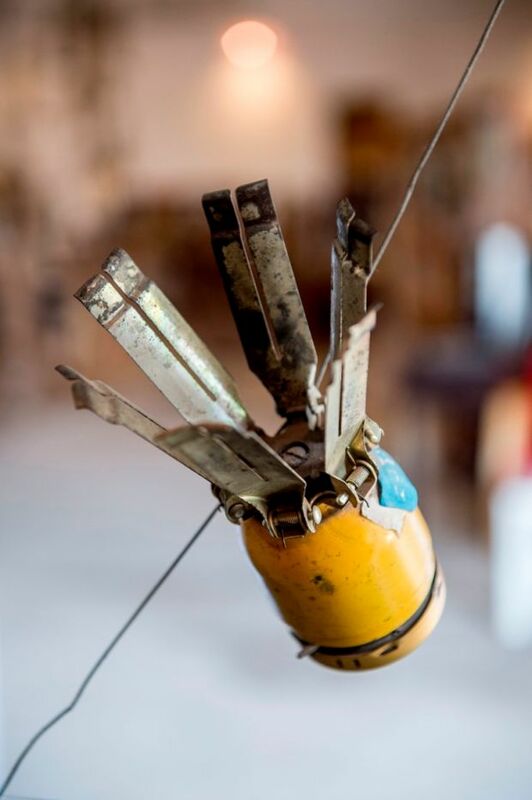 An installation of a cluster bomb hangs from the ceiling, the “bombies” falling from it. There are also many defused examples of the type of UXO dropped on the country. The people who have written in the visitors’ book this year have not held back. Before I leave the Cope visitor centre I have one last wander around. I’m looking at the tourists looking at the displays: at the now familiar map of Laos with the red dots, the cluster-bomb installation, the defused rockets and mortars and grenades. No matter where they are standing in the room, every one of them has an identical expression: utter disbelief.